Ririchiyo is a daughter of the rich and influential Shirakiin house. The envy of other girls made her a victim of bullying in her childhood. Those experiences have created a wall around her and the strong urge to be independent from other people. Over time she started acting moody and unfriendly to others, when in fact she really wants to make friends. In her urge for independance she moves out and decides to start living on her own in a mansion named Ayakashi Kan. In the Ayakashi Kan it is a custom to have all residents be accompanied by a member of the Secret Service (S.S.), which Ririchiyo of course refuses. The man assigned to her however, insists on serving her and pledges unyielding loyalty to the extend of a faithful dog. This man, who turns out to be a powerful fox spirit, seems to have some kind of connection to Ririchiyo’s past. 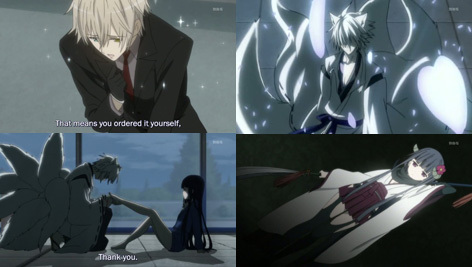 The strong points of Inu x Boku SS are the beautiful animations and the hilarious moments. However, the main running gag of Ririchiyo acting “tsundere” while her servant acts like a faithful dog, might over time get boring and repetitive to some if not changed. What confuses me a little is that this anime is often attributed with the shounen genre, even though a female main character who is fancied by bishounens is a typical feature of shoujo anime. For those who are not bothered by such distinctions, Inu x Boku SS is an entertaining comedy anime with a touch of romance and fantasy-action. This was So Cool . I want the episode 9 now .!! where can i watch the episodes from this anime? i will gonna whatch this movie promise!!! !